In recent years, China's plastic mold industry is rapidly developing, but there have also been some problems in the development. People in the industry know that each mold product is complex, the processing program is large, and the unit price is high. Collect and sort out relevant parts design, molding process, molding equipment, mechanical processing and special processing data to prepare for use when designing molds. How is silver streak / splay caused? 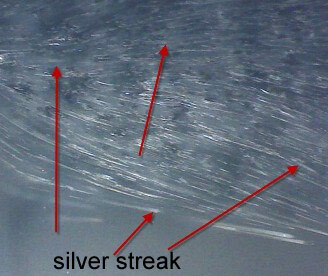 Silver Streaks / splay is usually caused by moisture, but can also be caused by high filling rates and poor vents which can cause entrapping of gas either from the environment, mold water leaks, etc. A single line that appears like a silver streak, I refer to as jetting. There are many causes but some to look at are the following. The filling process should be such that the speed is not so high until the gate is reached and material will solidify causing less shear heat as the injection speed is ramped up. 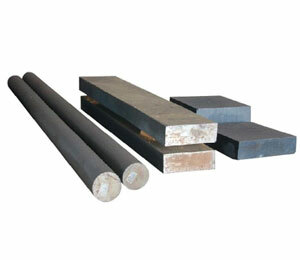 If you are blasting the material through a small gate, random shear stress can cause burning and jetting. 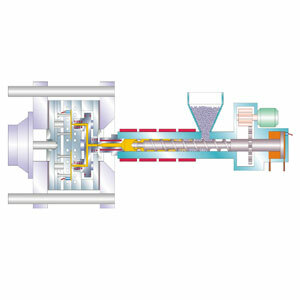 In the case of a nozzle, if small amounts of material solidify on the nozzle tip and then subsequently get injected into the mold/gate, the cooler material will tend to hang at the gate and free flowing material will flow around this point. Where the injected material meets can cause what looks like a silver streak but can actually be a single line that is actually a flow or knit line. Having a cold slug well at the end of the sprue/runner can trap this initial material from the nozzle before it gets to the gate and cavity. Gate thickness variation can cause the same issue if the tooling/ gate dimension is not equal. I will not go down the road around the tooling or processing assumptions in this matter but concentrate on the fact that it's a black colored part, and the black color has been introduced by using a masterbatch. There are a number of theoretical possibilities linked to the coloration as such and around the formulation of the masterbatch. The black colorant is likely a carbon black but could potentially also be a back iron oxide. Establish qualitative knowledge of the details of the masterbatch used linked to above mentioned factors. By a good co-operation with your masterbatch supplier, this should not be a problem to discuss. Investigate by DSC if the colorant introduced influence the Tc of the resin vs the neat resin. May be complemented by actual measurements on shrinkage between colored and non-colored parts as especially LDPE is difficult to measure statistical Tc differences on. An understanding of why the product does not break while functioning is helpful. If you know specifically what in the formulation makes the part not break when rotating then you can focus on that ingredient. Perhaps the original formulation development notes can shed some light. Why talc is used? Is it added to reinforce or physically strengthen the material or for some other property like opacity or just to cut costs? Is the break point random or consistent? If consistent is it weld line related? Or vent related? If part of an assembly, does the mating part affect it somehow? Inserts can cause cracks in mating parts. Failure during rotation: Does the load change or is it erratic or continuous? I have seen the problem of an incremental change in cushion each cycle for about 20 shots and then begin to decrease and return to nominal once before on a different make of injection molding machine. The shot size was minimal, 20% of the max. It was an amorphous resin, (I believe PC/ABS Blend). As the cushion would change we would go from making good parts to parts that were over packed and showed ejector marks. The pressure at cutoff changed with the cushion, as you would expect. We plotted all of the TC outputs by cycle, barrel zones, feed throat, thermolator, and thermocouples we attached to the tool. All of the zones appeared to be working normally. We spent a lot of time watching the feedback from the transducer tracking the screw position. We even hooked it up to a PC to monitor. The more information that you have to look at, the better your troubleshooting will be. RJG is a great way to take a look into the mold and see what is truly happening relative to injection, pack, hold and recovery (your injection process). Without the look into the mold, it really becomes more of a game of trial and error. How to make a molded part be approved by customer? Step 2 - make sure your machines and molds are properly maintained - Training - do you have a program? Step 4 - learn the 'method' for troubleshooting. I train this also. Troubleshooting can make a lot of scrap if you don't know how to do it efficiently. Check mating between nozzle tip and mold. Use colder nozzle / cone point insert. Why is the cooling time THAT long? 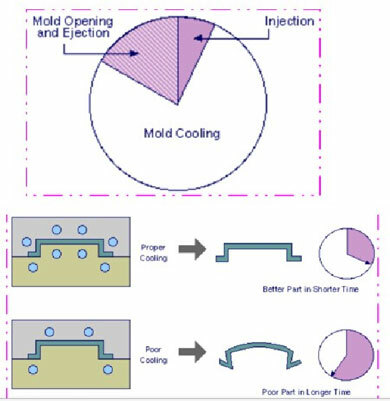 (A) "Why is the cooling time THAT long"
Because that is what the shrink rate built into the injection mold will allow for dimensionally acceptable parts. I have optimized gate seal, cooling rate, fill rate and melt temp. Unfortunately the injection mold maker missed the shrink on the steel. (B) "in plain language how do you duplicate the process in machine "A" when you put that mold in machine "B" that has a different size/capacity injection unit and clamp and not start from scratch?" (C) even better "How do you know that waterline hookup is (1) optimal for that mold and (2) identical to the last five times you ran it?" Reynolds calculation and/or delta P as for pattern I consult the water line diagram. The flow lines are related to the one side of the injection mold, not necessarily the geometry of the part or the composition of the plastic. Follow the instructions below to find the problem. 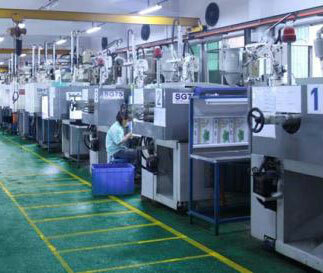 There is usually an offset between the injection mold steel that comes in contact with the plastic and the mold base. This is usually between .004" and .010", (.10mm to .25mm). With the injection mold closed and locked up, insert a feeler gage into the gap between the A & B sides. The gap should be very close from the left side of the mold to the right side of the mold. The right side of the injection mold will have a smaller gap. This makes the shut off surfaces of the tool not parallel.